Habatat is honored to have Kim Harty, head of glass at the College for Creative Studies in Detroit, Michigan, curate an exhibition at our gallery here in Royal Oak. StreetKraft features bold new artwork from around the world that is inspired by the street. This exhibition will open during regular gallery hours on Saturday, August 18th and will have a grand opening reception from 5 – 8pm on Saturday, September 8th. Welcome to the 215th edition of the Glass Interest Newsletter. • Fire Destroys Bothwell Studio – Update! • Habatat Opens StreetKraft Show- Now! • Black Swamp Art Festival – Now! • Momentum | Hot Glass Exhibition- New! • Toledo Honors History with Sculpture – New! • Think/Craft Symposium in Cleveland – New! • Pollack Glass Grand Opening – New! Fire Destroys Bothwell Studio – Update! • Sculptors Christina and Robert recently lost everything in their barn/studio when it burned to the ground. • Heller Gallery, Habatat Galleries, and Austin Art Projects have worked together to create an online exhibition from surviving artworks that are in their three galleries. All proceeds from sales will go to Christina and Robert. Should you have been considering acquiring a sculpture by Christina this would be a wonderful time to do so! Please feel free to contact any of the three galleries to discuss works or any questions you may have. Habatat Opens StreetKraft Show – Now! Black Swamp Art Festival – Now! • Glass will be represented along with jewelry, wood, 2-D sculpture, etc. 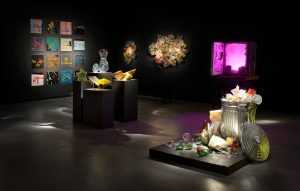 Momentum | Hot Glass Exhibition- New! • The Toledo Arts Commission, in conjunction with the Toledo Symphony Orchestra and the support of ProMedica and Toledo’s philanthropic community present the second edition of Momentum. Toledo Honors History With Sculpture – New! Think/Craft Symposium in Cleveland – New! o Zac Weinberg, Over/Under, blown, cut glass, found lamp, mixed-media. • Partnership with Pilkington Glass will lead to new collaborations between applications of glass as an artistic medium and manufacturing processes. Pollack Glass Grand Opening – New! • Hawk Galleries, The James Art Gallery at the James Cancer Hospital, and Richard Solove Research Institute at The Ohio State University’s Wexner Medical Center mount an exhibition works by Lino Tagliapietra. 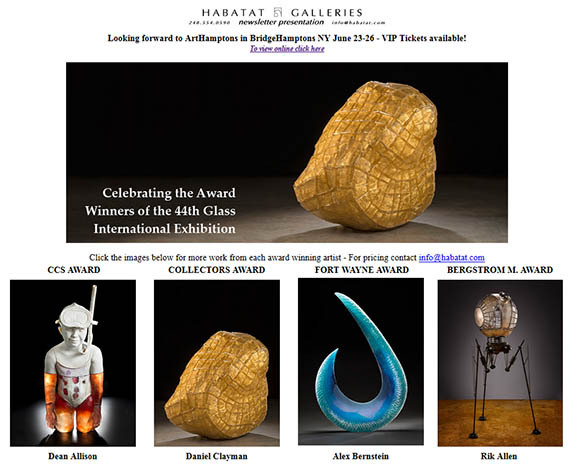 The Winning list is out celebrating the Awards given during Habatat Galleries 44th International Glass Invitational Award Exhibition. These award winners will be included in an exhibition at the Fort Wayne of Art in Fort Wayne Indiana this summer! Exhibition opens June 25th of 2016. Please email or call us.